Happy Valentine's Day Everyone! Hope that you and your sweetie had a great time. I am working on a little remodeling project in my house that I need a few more supplies for so I hope to show off my project tomorrow afternoon. But if you have something to show off...please do! Let me also take this opportunity to answer a few questions that I have received. Made it Monday is a place for you to show off something that you have MADE not necessarily created or developed. I started this little party because I wanted to show off some things I was proud of and that maybe wasn't getting the attention that I wanted (the Remington Man...usually just says, "Nice"). So please feel free to join if you need a place to show off your one-of-a-kind creation or your first ever crochet project! So here is my very late addition to this party. And it doesn't look all that impressive but it does wonders for my peace of mind. 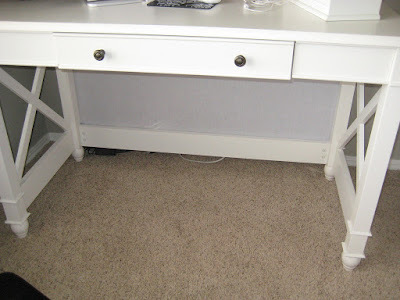 This is the new little writing desk I bought to put in our bedroom now that we are redoing our study into our son's nursery (so fun to say son by the way). I hate cords and everything that goes along with computers. I wanted to buy a cabinet but was unwilling to pay for it so I bought this little Better Homes and Garden desk from Walmart and saved $700 bucks. 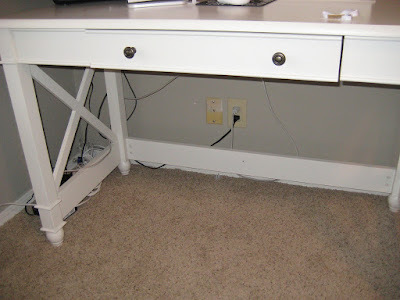 So to hide my cords I took an old sheet and cut it to fit the back of the desk and used clear packing tape to fix it to the braces and legs. Amazingly it hides almost everything! Very, very easy fix...unless you have a one year old playing peek-a-boo with you. So what have you MADE? Last minute Valentine: Candy Heart Necklace!